The term ‘latent heat storage material’ is commonly used as an alternative for Phase Change Material (PCM). PCM are materials which change their state from solid to liquid or change between two different solid crystallization states over a defined temperature range (phase transition). This process is reversible (reproducible phase transition) and can be used for thermotechnical purposes. The advantage of PCM compared to other storage materials is that they can absorb large amounts of energy per storage volume / mass with a small temperature difference between the storage medium and its surroundings, can store the energy over a period of time with minimal losses and finally, they can release the energy again when needed. PCM products and systems can be used to efficiently regulate temperatures in buildings. 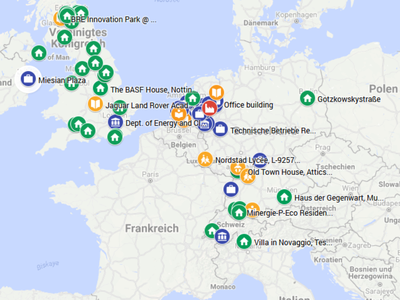 Click on the map to learn more about a selection of notable PCM systems at work in office buildings, factories, schools, greenhouses, homes, etc. around the world. Please send us a note if you want to contribute to the map.